Contrary to popular belief, INTJs have emotions. They also express them, though not always to the person they’re having feelings about (for example, an INTJ might tell his best friend he likes a girl, but not tell the girl. 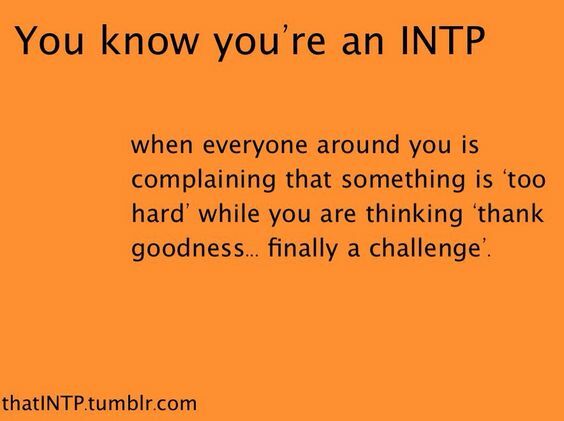 Or an INTJ might tell her husband she hates a coworker, but never give the coworker a hint). INTJs tend to compartmentalize their feelings and process them internally, and they hate expressing deep emotions casually or to people they don’t know well. 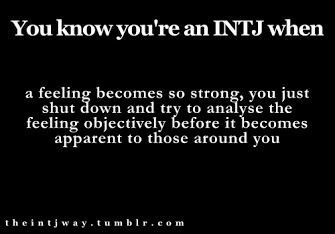 If you’re very observant, though, and get to know the INTJs in your life, you’ll start to realize there’s a remarkable depth to their feelings. They’ll even do things, like cry at movies, that are typically associated with Feeling personality types. They might scorn the things that are “supposed” to make you cry (e.g. I’m sniffling at a Pixar film and my INTJ sister laughs out loud in the theater). But then I’ll look over and notice moisture leaking from the corners of her eyes at the end of Hidden Figures (I’ve been informed it was not crying). As the character Mary Jackson tells a judge, someone always has to be first. These women proved it’s possible for women to be taken seriously and make important contributions as mathematicians and engineers. But I suspect my sister’s words go deeper than referring to breaking down gender stereotypes about the kind of work women can do. It also has to do with people’s expectations for what women should be like. Only 24-35% of women have a personality type that relies on Thinking as their primary or secondary mental process (according to the Center for Applications of Psychological Type). INTJ and INTP women are tied for rarest at 1-3% of the female population. ENTJs come in a close third at 1-4%. ENTPs tie with ESTPs with 2-4%, just slightly more common than ISTPs at 2-3%. The STJ types aren’t nearly as rare, with ESTJs making up 6-8% and ISTJs 7-10% of the female population. I’m not going to type the women in Hidden Figures, but having seen the film I think it’s safe to say Katherine G. Johnson, Dorothy Vaughan, and Mary Jackson are Thinking types. Their minds are naturally wired to excel at processing facts, figures, and data — a hall-mark of the fact-checking, analytical Thinking functions that use “impersonal criteria to make decisions.” I’d say Katherine at least is probably an Intuitive type as well, pairing pattern-recognition and possibility-seeking with her Thinking side. That means she wasn’t just a rarity at NASA (an African-American woman working in a highly technical position). She’s also a rarity in society (a woman using both Intuition and Thinking as her most comfortable mental processes). Thinking traits are so strongly stereotyped as masculine that NT women often don’t fit cultural expectations for femininity. One of the many things I loved about Hidden Figures is that these three women seemed to have figured out a way to balance being wives and mothers with working as groundbreakingly successful mathematicians. They’re also portrayed as real people who are admired and respected for who they are instead of as the bitchy, controlling, or cold stereotype we often get when presented with Thinking female characters (take Sandra Bullock’s character in The Proposal as an example). And the men they’re in relationships with aren’t scared of them or trying to fit them back in boxes. It was really wonderful to see characters that embraced femininity on their own terms. While I do believe God created the two genders to be different and complementary in the roles we fill, I also think there are stereotypes in our culture that do both genders a disservice. One of those is that women are or “should” be more emotion-driven than analytically-minded. There’s room for both. 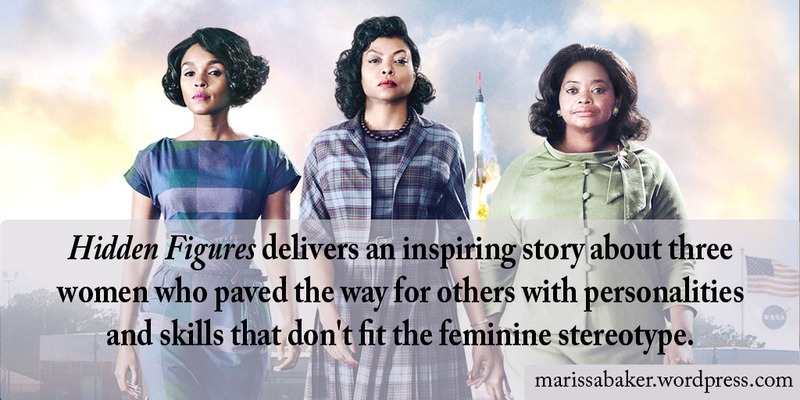 And, as Hidden Figures reminds us, we would do ourselves a terrible disservice if we tried to keep these women hidden.